Combine the olive oil, garlic, coriander seeds, mustard and tarragon with a splash of lemon juice and let sit for 30 minutes. 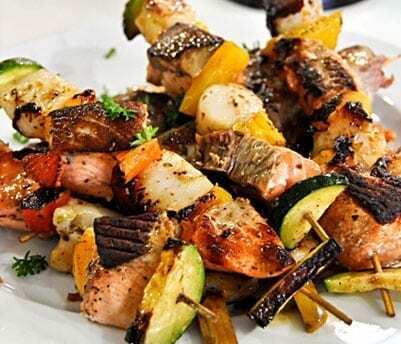 Thread the seafood onto the skewers and cook on the barbecue or the grill, about three to four minutes on each side and drizzle with the dressing when served. The farmers market is pleased to work together with the Lake Macquarie Council, offering the Lake Macquarie community a diversity of lifestyle experiences. Speers Point Park is Lake Macquarie's premier park. © 2018 Lake Macquarie City Farmers Market. ACN 134 663 451. ABN 86 134 663 451. Privacy. Disclaimer.